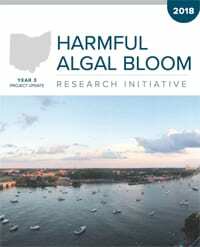 Ohio State’s Ohio Sea Grant program has released a third-year update on the Harmful Algal Bloom Research Initiative, a statewide effort that seeks solutions to Ohio’s harmful algal blooms. Scientists from CFAES are some of the many involved. Posted by Kurt Knebusch at 8:06pm Posted in At Home, In Business, On Campus, On The Farm and tagged Harmful Algal Blooms, Lake Erie, research, water quality. Bookmark the permalink.